When you've read a really good book by an author, you have high expectations for anything they write after that. I loved Chitra Banerjee Divakaruni's Sister of My Heart and Mistress of the Spices and I was sure I'd be just as entertained by her new book. 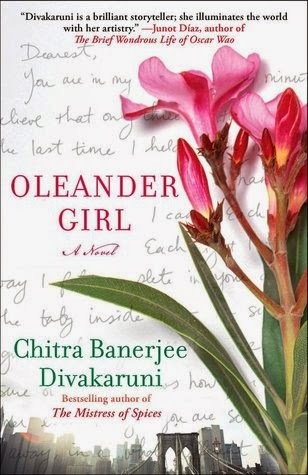 I wanted to love Oleander Girl so desperately, but (there's always a but, isn't there) the story line was too unbelievable in my opinion. Seventeen year old Korobi Roy comes from a prominent Hindu family. After her mother's death, Korobi is raised by her strong-willed grandfather and humble grandmother and educated at prestigious boarding schools. Betrothed to Rajat, the son of wealthy art dealers, Korobi refuses to get married without first researching a family secret that has been withheld from her since birth. Various events and people threaten to keep Korobi and Rajat from actually making it to the altar. The problem I had with the story was that Korobi was supposed to be a sheltered 17 year old who only knew life in Kolkata and at boarding school. So it takes a great suspension of belief to go along with the story of her hopping on a plane to America alone, navigating the streets of New York first, and traveling to California. It just seemed implausible. Based on that, it was difficult for me to really enjoy the book.